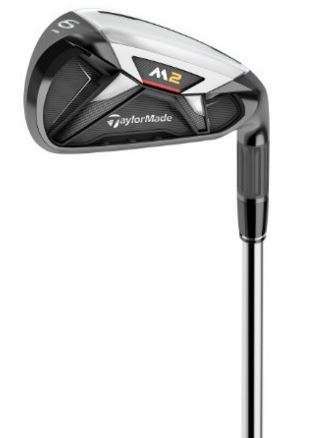 Taylormade’s new M2 irons are a game improvement set designed to maximize distance and forgiveness. A 360° Undercut face for more ball speed. The Taylormade Speed Pocket for increased flexibility due to an even thinner sole increases launch angle and preserves ball speed, improving forgiveness for shots struck below the center of the face. Inverted Cone Technology, which produces consistent ball speeds across the face. Incidentally, I think this has for a decade been TaylorMade’s best innovation. I am still playing ten year old R7 XD irons and think they’re still the longest I have played. A “3D Sound & Feel System” that manages sound and eliminates unwanted vibrations.